The central province of Thua Thien-Hue is planning to relocate some 4,200 households from the Hue Citadel area to better preserve the relic. Locating on the northern bank of the Huong or Perfume River, the Hue Citadel which was built by the Nguyen Dynasty (1802-1945) covers an area of 500ha with a system of three circles of ramparts, the Hue Capital Citadel, the Royal Citadel and the Forbidden Citadel. According to Phan Van Tuan, vice director of the Hue Monuments Conservation Centre, all the constructions within the citadel were built closely connected and so should be protected from outer interference. "Between 1996-2018 we had moved 1,050 households from the citadel during the renovation and upgrade of the work here," Tuan said. As many as 4,201 households who are using nearly 40ha of land in the citadel will be moved out between 2019 and 2021 according to a plan from the centre. A report by local authorities said the city is struggling to find land to resettle the residents who do not want to settle far from the city centre. Tuan said that he city had chosen a 73-hectare-area in Huong So Ward which lies some two kilometres from the nearest point away from the citadel as a resettlement area for the affected families. However, during a recent visit by the province’s people’s committee chairman Phan Ngọc Tho, some members of the community told Tho that the resettlement apartments built in Huong So Ward did not meet living standards, so they refused to move. Meanwhile, the provincial people’s committee said the estimated cost to evacuate the families from the citadel was VND2.8 trillion (USD123 million), which is a significant burden on the local budget. "Besides, we need more money to renovate the citadel after the relocation," Tho said. "We are seeking for financial support from the government." Hue City was the capital under the Tay Son Dynasty. 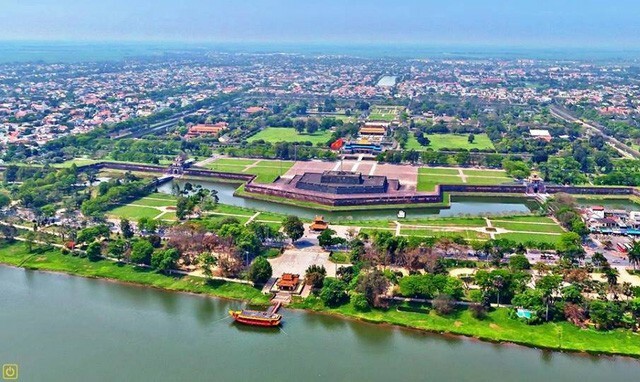 Hue royal complex has been officially recognised by the UNESCO as a World Heritage Site since 1993 when local authorities designed measures to evacuate the residents for better preservation. Surveys show that these communities appeared around 1975, as residents attempted to settle after the war. In 1999, heavy flooding hit Hue and sent more families to the citadel walls after their homes and boats were destroyed. The centre’s director Phan Thanh Hai said living on the wall is a violation of laws protecting heritage sites. “The weight of the families living on top of the walls causes damage and subsidence,” he said. The residents have different ways of occupying the wall. The majority of them construct temporary houses on top and erect wooden ladders to reach them. Many others have built concrete structures, with some even looking likes villas, breaking part of the wall to make entrance alleys. Others have made use of collapsed sections, clearing the debris for housing or demolishing the wall themselves to construct homes. Residents living near the wall have also used space on top for farming.